It is against the law for employers to refuse to provide pregnant women reasonable accommodations necessary to perform their job. The New Jersey legislature amended the New Jersey Law Against Discrimination in 2014 to specifically include pregnancy as a protected class of persons. This means the law now specifically prohibits employers from discriminating against pregnant employees. 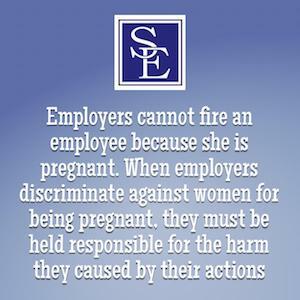 The law also requires that employees provide reasonable accommodations to pregnant employees. New Jersey's pregnancy law recognizes that pregnant women are particularly vulnerable to discrimination and to combat this form of discrimination, employers must provide reasonable accommodations. Reasonable accommodations to pregnant women can include such things as bathroom breaks, breaks for increased water intake, periodic rest, assistance with manual labor, job restructuring or modified work schedules, and temporary transfers to less strenuous or hazardous work. Reasonable accommodations must be provided to a pregnant employee unless the employer can show that providing the accommodation would cause an undue hardship to its business operations. In determining whether a particular requested accommodation imposes an undue hardship on the operation of an employer's business, the court will consider factors such as the size of the employer, number and type of facilities, size of budget, employer's operations, employer's workforce, nature and cost of the accommodation, taking in consideration the availability of tax credits, tax deductions and outside funding and to the extent to which the accommodation would involve waiver of an essential requirement of the job as opposed to a tangential or non-business necessity requirement. Prior to making the determination that a pregnant employee cannot be reasonably accommodated, the employer and employee must first engage in an interactive process to search for and determine what the appropriate reasonable accommodations are necessary. This requires the employer to act in good faith and take the initiative to attempt to identify the potential reasonable accommodations that could be provided to overcome the employee's precise limitations resulting from the pregnancy. Employers can show their good faith by meeting with the employee, requesting information about the condition and limitations it has on the employee, asking the employee the accommodation they need, consider the employee's request and offer and discuss available alternatives when the request is too burdensome. The employee must also act in good faith to communicate and work with the employer to identify potential reasonable accommodations. The process must be interactive because the employer and the employee both hold information that the other does not have or cannot easily obtain. It is important to know your rights as a pregnant employee under the law, including New Jersey Law against Discrimination. If you believe you have unlawfully been denied a pregnancy related reasonable accommodation, please call one of our New Jersey pregnancy discrimination lawyers to discuss the specifics of your potential claim.